Open the VNC viewer (for example, TigerVNC) on the workstation you will be using to connect to the system being installed. A window similar to TigerVNC Connection Details will be displayed with an input field allowing you to specify an IP address. 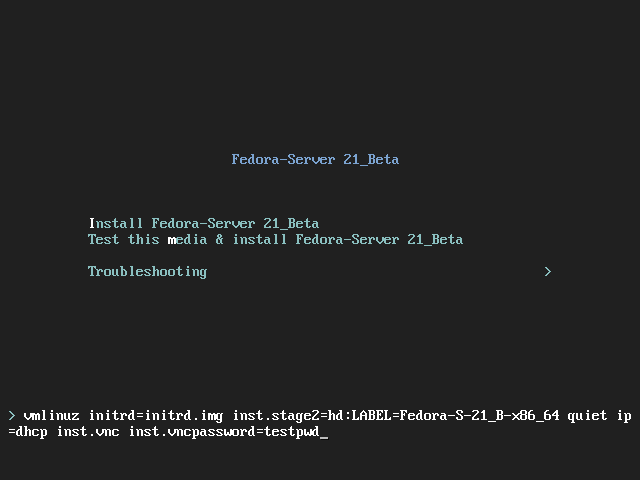 Configure the PXE server to use the boot options for a connect mode VNC installation. For information on these boot options, see Installing in VNC Connect Mode. Follow the procedure for a VNC Installation using connect mode as described in the Starting VNC in Connect Mode. However, when directed to boot the system, boot it from the PXE server.